Got side tracked looking for my diagrams of design models, then on to looking for information about construction of timber ramps and the detail as it merges with the ground smoothly. No help, most details cut the timber in ways I don’t like: namely at way too shallow an angle. But at leasts got some alternative ideas from ramps constructed from other materials and devices used to get around obstacles where no ramps are provided. Whilst the book is called engineering design, its really about mathematical analysis and evaluation: or quantitative evidence of suitability, assessment of the fitness for function. Put another way design is a creative activity and such is not covered any where in the book. That aside however the main point of the diagram is to illustrate that design is an iterative activity, and that at any point can loop back to any previous step, including right back to the beginning. Forward is always considered as one step to the next, but backwards can jump any number of steps. Thus one step forward and two steps back is a common saying. If unlucky then right back to the start. Thus the want of only calcs-for-council is seldom useful as there has typically been no prior design, just specification of wants, whims and desires. Where the specification is typically an incomplete description of intent. Thus based on the model above there isn’t anything to synthesise and therefore there isn’t anything suitable for mathematical analysis, or any other form of analysis. Or put another way before can start on quantitative design issues first need to have completed the qualitative aspects of design. The qualitative aspects of design should lead then to defining the form in terms of geometry (shape), from which can start to give some dimensions. The early stages of design can take place using block diagrams, bubble diagrams, flow charts, with no need for pictorial representation of the technology involved. As design progresses, then can move onto scaled drawings which more properly illustrate the dimension and geometry. From there can start to do stress calculations which in turn may require modification of the original scaled drawings. Which is why design tends to be based on freehand sketches, until such point as need more accurate reference to dimensions and geometry. Traditionally most dimensions were calculated where accuracy important: for example a drawing where 1mm = 100mm is not a good drawing to scale a needed dimension from: the length of a beam could end up some 100mm to 200mm shorter than it needs to be. But drawing scale drawings and showing details which need to be taken into consideration for the calculations is cumbersome. So freehand sketches are used to identify all the elements to be considered. Unfortunately may miss some components in the freehand sketch: so scaled drawings of over all members and details start to become important. Computer aided drafting (CAD), now allows the computer to calculate the dimensions, if all the necessary detail is included. But still have problems with the scaling of the models for various purposes and presenting the data in a suitable manner so that it is informative. Though parametric modelling and building information modelling (BIM) create better separation of modelling from presentation and enable the one model to be presented in different ways. For example at different scales details appear and disappear: whilst dimensions should remain valid and appropriate to the presentation. Drafting skills are still important, and as far as I am aware, historically the very concept of design started with drawing and/or sculpting scale models. Problems are better solved on the proverbial “drawing board”, though today the drawing board is likely a computer with drafting software. 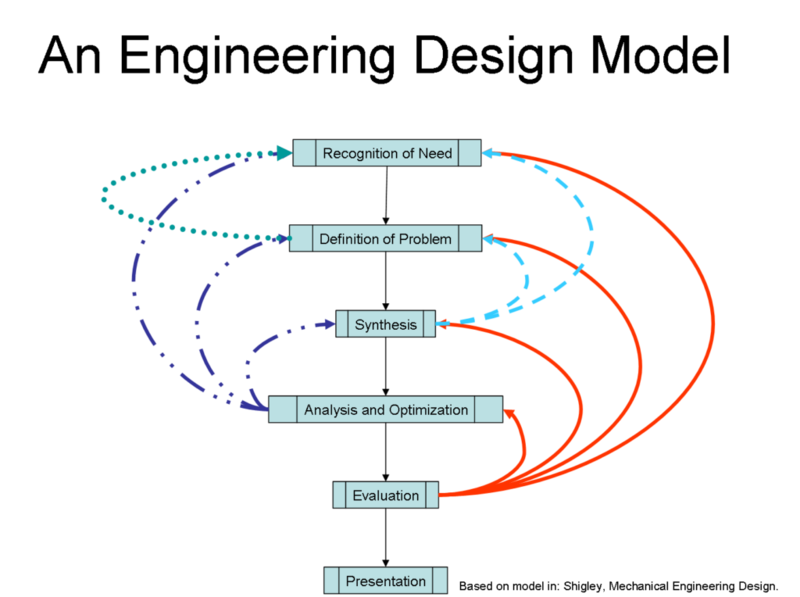 With time more and more of the physical characteristics of a technology will be modelled by computer, and therefore will be able to simulate the operation of that technology and modify the specification as necessary to improve its performance,without the user having knowledge of the mathematics behind the modelling: though a qualitative understanding of the parameters will be important to using such software proficiently.